Political contra-distinction to "the Reds", whose revolutionary Red Army supported the Bolshevik government. Historical reference to absolute monarchy, specifically recalling Russia's first Tsar, Ivan III (reigned 1462–1505), at a period when some styled the ruler of Muscovy Albus Rex ("the White King"). The white uniforms of Imperial Russia worn by some White Army soldiers. Above all, the White movement emerged as opponents of the Red Army. The White Army had the stated aim to keep law and order in Russia as the Tsar's army before the civil war and the salvation of Russia. They worked to remove Soviet organizations and functionaries in White-controlled territory. [M]y task in winning support in Parliament for the Russian Nationalist cause will be infinitely harder if well-authenticated complaints continue to be received from Jews in the zone of the Volunteer Armies. Many of the White leaders were conservative, accepting autocracy while remaining suspicious of "politics" (which they characterized as consisting of speeches, elections, and party activities). Aside from being anti-Bolshevik and anti-Communist and patriotic, the Whites had no set ideology or main leader. 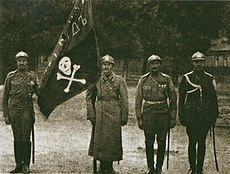 The White Armies did acknowledge a single provisional head of state in a Supreme Governor of Russia in a Provisional All-Russian Government, but this post was prominent only under the leadership in the war campaigns during (1918–1920) of Admiral Alexander Kolchak, formerly of the previous Russian Imperial Navy. The movement had no set plan for foreign policy. Whites differed on policies toward the German Empire in its extended occupation of western Russia, the Baltic states, Poland and the Ukraine on the Eastern Front in the closing days of the World War, debating whether or not to ally with it. The Whites wanted to keep from alienating any potential supporters and allies and thus saw an exclusively monarchist position as a detriment to their cause and recruitment. White-movement leaders such as Anton Denikin advocated for Russians to create their own government, claiming the military could not decide in Russians' steads. Admiral Alexander Kolchak succeeded in creating a temporary wartime government in Omsk, acknowledged by most other White leaders, only for it to fall with the loss of his armies. Some warlords who were aligned with the White movement, such as Grigory Semyonov and Roman Ungern von Sternberg, did not acknowledge any authority but their own. Consequently, the White movement had no set political leanings as members could be monarchists, republicans, rightists, or Kadets. 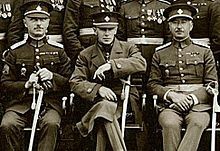 Among White Army leaders, neither General Lavr Kornilov nor General Anton Denikin were monarchists, yet General Pyotr Nikolayevich Wrangel was a monarchist willing to soldier for a republican Russian government. Moreover, other political parties supported the anti-Bolshevik White Army, among them the Socialist-Revolutionary Party, and others who opposed Lenin's Bolshevik October Revolution of 1917. Depending on the time and place, those White Army supporters might also exchange right-wing allegiance for allegiance to the Red Army. Unlike the Bolsheviks, the White Armies did not share a single ideology, methodology, or political goal. They were led by conservative generals with different agendas and methods, and for the most part they operated quite independently of each other, with little coordination or cohesion. The composition and command structure of White armies also varied, some containing hardened veterans of World War I, others more recent volunteers. These differences and divisions, along with their inability to offer an alternative government and win popular support, prevented the White armies from winning the Civil War. 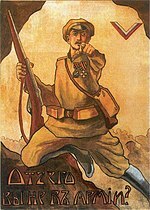 The Volunteer Army in South Russia became the most prominent and the largest of the various and disparate White forces. Starting off as a small and well-organized military in January 1918, the Volunteer Army soon grew. The Kuban Cossacks joined the White Army and conscription of both peasants and Cossacks began. In late February 1918, 4,000 soldiers under the command of General Aleksei Kaledin were forced to retreat from Rostov-on-Don due to the advance of the Red Army. In what became known as the Ice March, they traveled to Kuban in order to unite with the Kuban Cossacks (most of whom did not support the Volunteer Army.) In March, 3,000 men under the command of General Viktor Pokrovsky joined the Volunteer Army, increasing its membership to 6,000, and by June to 9,000. In 1919 the Don Cossacks joined the Army. In that year, between May and October, the Volunteer Army grew from 64,000 to 150,000 soldiers and was better supplied than its Red counterpart. The White Army's rank-and-file comprised active anti-Bolsheviks, such as Cossacks, nobles, and peasants, as conscripts and as volunteers. The White movement had access to various naval forces, both seagoing and riverine, especially the Black Sea Fleet. The Whites and the Reds fought the Russian Civil War from November 1917 until 1921, and isolated battles continued in the Far East until 1923. The White Army—aided by the Allied forces (Triple Entente) from countries such as Japan, the United Kingdom, France, Italy and the United States and (sometimes) the Central Powers forces such as Germany and Austria-Hungary—fought in Siberia, Ukraine, and the Crimea. They were defeated by the Red Army due to military and ideological disunity, as well as the determination and increasing unity of the Red Army. White organising in the South started on 15 November 1917, (Old Style) under General Mikhail Alekseev (1857–1918). In December 1917, General Lavr Kornilov took over the military command of the newly named Volunteer Army until his death in April 1918, after which General Anton Denikin took over, becoming head of the "Armed Forces of the South of Russia" in January 1919. The Southern Front featured massive-scale operations and posed the most dangerous threat to the Bolshevik Government. At first it depended entirely upon volunteers in Russia proper, mostly the Cossacks (among the first to oppose the Bolshevik Government). On 23 June 1918, the Volunteer Army (8,000–9,000 men) began its so called Second Kuban Campaign with support from Pyotr Krasnov. By September, the Volunteer Army comprised 30,000 to 35,000 members, thanks to mobilization of the Kuban Cossacks gathered in the North Caucasus. Thus the Volunteer Army took the name of the Caucasus Volunteer Army. On 23 January 1919, the Volunteer Army under Denikin oversaw the defeat of the 11th Soviet Army and then captured the North Caucasus region. After capturing the Donbass, Tsaritsyn and Kharkov in June, Denikin's forces launched an attack towards Moscow on 3 July, (N.S.). Plans envisaged 40,000 fighters under the command of General Vladimir May-Mayevsky storming the city. 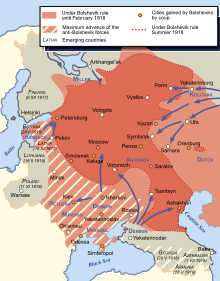 After General Denikin's attack upon Moscow failed in 1919, the Armed Forces of the South of Russia retreated. On 26 and 27 March 1920, the remnants of the Volunteer Army evacuated from Novorossiysk to the Crimea, where they merged with the army of Pyotr Wrangel. The Eastern Front started in spring 1918 as a secret movement among army officers and right-wing socialist forces. In that front, they launched an attack in collaboration with the Czechoslovak Legions (then stranded in Siberia by the Bolshevik Government, who barred them from leaving Russia) and with the Japanese, who also intervened to help the Whites in the east. Admiral Alexander Kolchak headed the eastern White counter-revolutionary army and a provisional Russian government. Despite some significant success in 1919, the Whites were defeated being forced back to Far Eastern Russia, where they continued fighting until October 1922. When the Japanese withdrew, the Soviet army of the Far Eastern Republic retook the territory. The Civil War was officially declared over at this point, although Anatoly Pepelyayev still controlled the Ayano-Maysky District at that time. 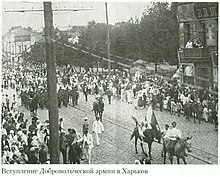 Pepelyayev's Yakut revolt, which concluded on 16 June 1923, represented the last military action in Russia by a White Army. It ended with the defeat of the final anti-communist enclave in the country, signalling the end of all military hostilities relating to the Russian Civil War. Headed by Nikolai Yudenich, Evgeni Miller, and Anatoly Lieven, the White forces in the North demonstrated less co-ordination than General Denikin's Army of Southern Russia. The Northwestern Army allied itself with Estonia, while Lieven's West Russian Volunteer Army sided with the Baltic nobility. Adventurers led by Pavel Bermondt-Avalov and Stanisław Bułak-Bałachowicz played a role as well. The most notable operation on this front, Operation White Sword, saw an unsuccessful advance towards the Russian capital of Petrograd in the autumn of 1919. The defeated anti-Bolshevik Russians went into exile, congregating in Belgrade, Berlin, Paris, Harbin, Istanbul, and Shanghai. They established military and cultural networks that lasted through the World War II (1939–1945), e.g. the Russian community in Harbin and the Russian community in Shanghai. Afterward, the White Russians' anti-Communist activists established a home base in the United States, to which numerous refugees emigrated. Moreover, in the 1920s and the 1930s the White Movement established organisations outside Russia, which were meant to depose the Soviet Government with guerrilla warfare, e.g., the Russian All-Military Union, the Brotherhood of Russian Truth, and the National Alliance of Russian Solidarists, a far-right anticommunist organization founded in 1930 by a group of young White emigres in Belgrade, Yugoslavia. Some white émigrés adopted pro-Soviet sympathies and were termed "Soviet patriots". These people formed organizations such as the Mladorossi, the Eurasianists, and the Smenovekhovtsy. A Russian cadet corps was established to prepare the next generation of anti-Communists for the "spring campaign"—a hopeful term denoting a renewed military campaign to reconquer Russia from the Soviet Government. 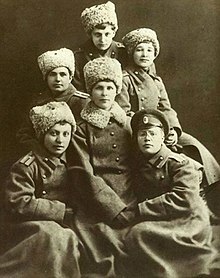 In any event, many cadets volunteered to fight for the Russian Corps during the Second World War, when some White Russians participated in the Russian Liberation Movement. After the war, active anti-Soviet combat was almost exclusively continued by the National Alliance of Russian Solidarists. Other organizations either dissolved, or began concentrating exclusively on self-preservation and/or educating the youth. Various youth organizations such as the Russian Scouts-in-Exteris became functional in raising children with a background in pre-Soviet Russian culture and heritage. Some supported Zog I of Albania during the 1920s and a few independently served with the Nationalists during the Spanish Civil War. White Russians also served alongside the Soviet Red Army during the Soviet invasion of Xinjiang and the Islamic rebellion in Xinjiang in 1937. After the February Revolution, in western Russia both Finland, Estonia, Latvia and Lithuania declared themselves independent, but they had substantial Communist or Russian military presence. Civil wars followed, wherein the anti-Communist side may be referred to as White Armies, e.g. the White Guard-led, partially conscripted army in Finland (valkoinen armeija). However, since they were nationalists their aims were substantially different from the Russian White Army proper; for instance, Russian White generals never supported Finnish independence. The defeat of the Russian White Army made the point moot in this dispute. The countries remained independent and governed by non-Communist governments. ^ Joana Breidenbach (2005). Pál Nyíri, Joana Breidenbach, ed. China inside out: contemporary Chinese nationalism and transnationalism (illustrated ed.). Central European University Press. p. 90. ISBN 978-963-7326-14-1. Retrieved 18 March 2012. Then there occurred another story which has become traumatic, this one for the Russian nationalist psyche. At the end of the year 1918, after the Russian Revolution, the Chinese merchants in the Russian Far East demanded the Chinese government to send troops for their protection, and Chinese troops were sent to Vladivostok to protect the Chinese community: about 1600 soldiers and 700 support personnel. ^ "The Tragedy of Albania's Russian Community". Russkiy Mir Foundation. 19 September 2008. Retrieved 12 July 2018. ^ Sven Anders Hedin, Folke Bergman (1944). History of the expedition in Asia, 1927–1935, Part 3. Stockholm: Göteborg, Elanders boktryckeri aktiebolag. pp. 113–115. Retrieved 2010-11-28..
^ Great Britain. Foreign Office (1997). British documents on foreign affairs—reports and papers from the Foreign Office confidential print: From 1940 through 1945. Asia, Part 3. University Publications of America. p. 401. ISBN 1-55655-674-8. Retrieved 28 October 2010. ^ Lehtovirta, Jaako (2002). "The Use of Titles in Heberstein's 'Commentarii'. Was the Muscovite Tsar a King or an Emperor?". In von Gardner, Johann. Schriften zur Geistesgeschichte des östlichen Europa [Essays on the intellectual history of eastern Europe]. Wiesbaden: Otto Harrassowitz Verlag. p. 190. ISSN 0340-6490. Retrieved 31 July 2015. It was Ivan III (1462-1505) who is well known as the first one to present himself as a tsar to foreigners, though it must be accepted that his use of the title was very sparse. ^ Lehtovirta, Jaako (2002). "The Use of Titles in Heberstein's 'Commentarii'. Was the Muscovite Tsar a King or an Emperor?". In von Gardner, Johann. Schriften zur Geistesgeschichte des östlichen Europa [Essays on the intellectual history of eastern Europe]. Wiesbaden: Otto Harrassowitz Verlag. p. 189. ISSN 0340-6490. Retrieved 31 July 2015. [...] the brief mention that the Muscovite ruler is by some called 'the White King' ('albus rex'). ^ a b Kenez 1980. 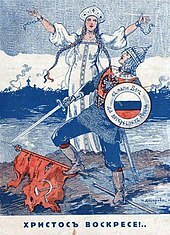 ^ a b Christopher Lazarski, "White Propaganda Efforts in the South during the Russian Civil War, 1918–19 (The Alekseev-Denikin Period)", The Slavonic and East European Review, Vol. 70, No. 4 (Oct., 1992), pp. 688–707. ^ Viktor G. Bortnevski, "White Administration and White Terror (The Denikin Period)", Russian Review, Vol. 52, No. 3 (Jul., 1993), pp. 354–366. ^ Kenez 1980, p. 74. ^ Christopher Lazarski, "White Propaganda Efforts," 689. ^ Kenez 1980, p. 62. ^ Rubenstein, Richard L., and John K. Roth. Approaches to Auschwitz: The Legacy of the Holocaust. London: SCM, 1987, p. 138. ^ Joseph Cohen, Michael (1985). Churchill and the Jews. Google Books. ISBN 9780714632544. ^ Kenez 1980, p. 60–61. ^ Christopher Lazarski, "White Propaganda Efforts," 690. ^ Kenez 1980, p. 58–59. ^ Kenez 1980, p. 69. ^ Kenez 1980, p. 59. ^ Kenez, Peter, Civil War, 90. ^ Kenez, Peter, Civil War, 18–22. ^ "The R.A.F. in Russia". The Aeroplane. 17 (1): 82. 1919. Retrieved 9 February 2014. Soon after landing we started to recruit for the Slavo-British Aviation Corps (S.B.A.C.) [...]. ^ Kenez, Peter, Civil War, 18. ^ Kenez 1980, p. 65. ^ Viktor G. Bortnevski, White Administration and White Terror, 360. ^ Kenez, Peter, Civil War, 94–95. ^  Oleg Beyda, 'Iron Cross of the Wrangel's Army': Russian Emigrants as Interpreters in the Wehrmacht, Journal of Slavic Military Studies 27, no. 3 (2014): 430–448. Kenez, Peter (1980). "The Ideology of the White Movement". Soviet Studies. 32 (32): 58–83. doi:10.1080/09668138008411280. This page was last edited on 9 April 2019, at 16:08 (UTC).